NEW. 9780195112887 This listing is a new book, a title currently in-print which we order directly and immediately from the publisher. Print on Demand title, produced to the highest standard, and there would be a delay in dispatch of around 10 working days. For all enquiries, please contact Herb Tandree Philosophy Books directly-customer service is our primary goal. Very Good. 0195112881 Crisp, clean, unread hardcover with light shelfwear and edgewear with a publisher's mark to one edge-Nice! Very Good in Very Good dust jacket. 0195112881. Inscribed by Sissela Bok to Julius Moravcsik on title page. Light shelfwear to book and DJ. ; Xxii, 142pp. 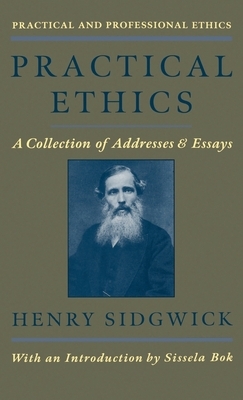 A classic work in the field of practical and professional ethics, this collection of nine essays by English philosopher and educator Henry Sidgwick (1838-1900) was first published in 1898 and forms a vital complement to Sidgwick's major treatise on moral theory, The Methods of Ethics. Reissued here as Volume One in a new series sponsored by the Association for Practical and Professional Ethics, the book is composed chiefly of addresses to members of two ethical societies that Sidgwick helped to found in Cambridge and London in the 1880s. Clear, taut, and lively, these essays demonstrate the compassion and calm reasonableness that Sidgwick brought to all his writings. ; Practical and Professional Ethics; 142 pages. New. Sewn binding. Cloth over boards. Contains: Illustrations, black & white. Practical and Professional Ethics Series. Very Good with no dust jacket. Pictorial hardcovers clean and sharp. Interior clean, binding secure. Practical and Professional Ethics Series. 8vo 8"-9" tall Professional bookseller for twenty years. Orders shipped daily in cardboard bookfolds.